Learn How to Combat Your Phobia of Needles with Hypnosis! Whether fear of needles is causing a problem because you want to give blood, have to have injections for health reasons, or for inoculations before going abroad, needle phobia can be a major problem. My Overcome Fear of Needles Hypnosis MP3 can help! The needle phobia taps into the brain’s natural defence mechanism against blood loss, which will lower your blood pressure – causing faintness. Happily, my hypnotherapy to overcome fear of needles MP3 can remove this unconscious response quickly and comfortably. After using the Overcome Fear of Needles Hypnosis MP3 session, you will notice immediately that even thinking about an injection is easier. And when you go for an injection, you will be amazed that you are much more relaxed than you ever were. (We can’t promise you will actually like injections though!) Being uncomfortable around needles is normal – needle phobia can be cured. Steve G. Jones, Ed.D., Clinical Hypnotherapist, charges $1,500 for a custom recording and $25,000 for a one-hour private hypnotherapy session at his office. But you can get all the benefits for this low price. 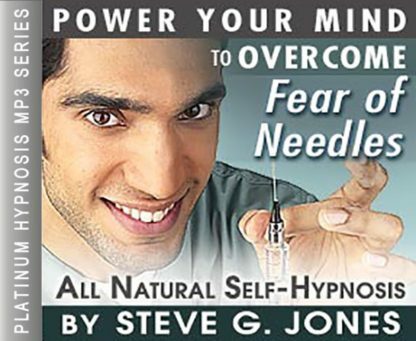 Simply listen to the Overcome Fear of Needles Hypnosis MP3 download every night as you go to bed for three weeks and feel the changes happening in your life. You will feel more empowered, more in touch with your true self, and you will truly know that your goals are within your reach. Steve G. Jones achieves AMAZING and LASTING results!!! Hypnosis is the easiest way to affect change in your life because the positive messages go straight to your subconscious mind effortlessly so you can accomplish your goals and reach for the stars!! All you have to do is listen to the Overcome Fear of Needles Hypnosis MP3 audio at night as you go to sleep!!! You’ll hear soft music, the gentle sounds of the beach, and the soothing sound of Steve G. Jones’ voice all working together to bring about positive changes in your life easily and naturally. Steve G. Jones has been helping people improve their lives with hypnosis for over 17 years…now it’s time for him to help YOU… don’t wait, do it NOW !!! you’ll be glad you did. See you at the top! And as you relax deeper, deeper and more deeply relaxed, I would like you now to imagine yourself sitting in a movie theater. And you are watching a movie and you are the star of the movie. You are also in charge of the projector in the projector booth. So there are three versions of you. One, is up in the projection booth, running the movie. Version two, where you find yourself now, sitting in the theater watching that movie and version three is the star of the movie. And at anytime you can move your consciousness to any of the three locations. Right now you find your consciousness in version number two, sitting in the theater, watching the movie. And this movie, starring you, is about needles. And as you watch yourself in that movie you see yourself performing various activities as part of your role in that movie. You see yourself receiving injections through needles. You see yourself donating blood through needles. And if at anytime you would like, you can imagine yourself up in the projection booth watching the movie or even stopping the movie because you are in charge of where your consciousness is. And you are also in charge of the movie, stopping it and starting it. But you are still watching the movie from your location in the theater in version number two of yourself. And you realize you can relax because you are sitting in a movie theater, watching a movie about yourself interacting with needles. And the more you listen to this recording, the more you comfortable you become with the idea of interacting with needles and at anytime now or in future listening of this recording, you can imagine yourself in the movie. Seeing things from the point of view of the version of you that is in the movie, experiencing his or her reality, seeing life through his or her eyes. You’re so relaxed and if you imagine yourself now in that movie, you are relaxed because you realize that at anytime you can return to the point of view of the observer from the movie theater or the person who is running the movie way up in the projection booth, safe. And you can even stop the movie if you choose. And because you realize these liberties are the powers you have, you are relaxed if you imagine yourself now in the movie, donating blood, receiving injections all through needles. Because you are becoming more and more relaxed with the idea of needles. You realize that they were developed to help people just like yourself, help them receive powerful, helpful injections and help donate blood. So you realize that needles are good and you are relaxed while you are around needles. So relax now, deeper and deeper and more deeply relaxed. And every time you listen to this recording, you will be able to go further, further with your self-confidence and spend more time experiencing situations through the point of view from the third version of you, the version that is in the movie, interacting with the needles. So relax now and realize that this will happen easily and effortlessly because you are committed to being comfortable with needles. Relax now, relax. You are not alone in your fear of needles. As much as 10% of the population fears needles. Reactions to your fear could include sweating, anxiety, and even fainting. If your fear of needles goes so far as to prevent you from seeing a doctor, then you must do something about it! Your fear of needles can easily be overcome with the help of hypnotherapy. Hypnosis is a natural and effective method to permanently remove fears. Whatever your reason is for fearing needles, this powerful self-hypnosis session can help you get rid of your fear once and for all. Realize that you do not have to be afraid of needles. Hypnotherapy will help you confront your fear of needles. This Overcome Fear of Needles Hypnosis MP3 allows you to change your thought process from fear to acceptance. You will be calm and relaxed when preparing for a doctor’s appointment. You will feel at ease when you see a needle. Hypnosis is very powerful and it will help you overcome your fear of needles. You will also learn how to cope with the process of a needle being stuck into your skin. Hypnosis is a great tool to use to relax and calm yourself down. It also teaches you to manage pain. You can actually use self-hypnosis while at the doctors. This Overcome Fear of Needles Hypnosis MP3 session will help you have a more positive experience and not fear needles.